﻿With Ilhan Omar facing criticism over tweets and statements regarding Israel, Nathan Young wonders if there’s a parallel with the Jeremy Corbyn anti-semitism controversy. 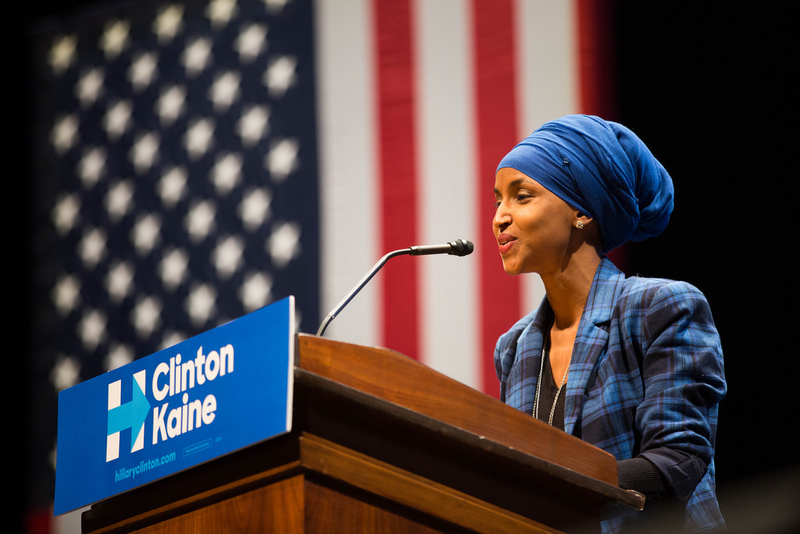 Share the post "Ilhan Omar and the right’s repetitive playbook"
Like many of her fellow freshman Congress women, Ilhan Omar of Minnesota’s 5th congressional district has been causing controversy stating the obvious and advocating mild social democratic reforms. Along with Rashida Talib and Alexandria Ocasio-Cortez, Omar has spent the few short months since entering congress supporting the “Green New Deal” and suggesting that America may still have a racism problem. None of this, though, has garnered quite as much attention as Omar’s comments about the American-Israel Public Affairs Committee (AIPAC). Defending a tweet that claimed that American lawmakers commitment to Israel was all about the benjamins”, Omar claimed that said benjamins were provided by AIPAC. Condemned immediately as an anti-semite by people across the american establishment, Omar had found an aspect of bipartisan consensus beyond criticism. Omar’s tweets and comments were about largely non-jewish lawmakers. She later came under fire once more for commenting, “I want to talk about the political influence in this country that says it is okay to push for allegiance to a foreign country” at a public event. Clearly she’s talking about Israel. More specifically it’s in the context of a bill targeting the Boycott Divestment and Sanctions (BDS) movement brought into the house as the first bill of the current congress. Omar was accused of playing into the “duel loyalty” trope, which is the idea that Jews are less loyal to their own society than they are either to Israel, or, worse, international Jewry. Consider, however, that the bill in question targets people involved in a particular boycott, which may well constitute a violation of the First Amendment of the US Constitution. Consider also that Omar was talking about herself, and her mostly non-Jewish colleagues. Non-Jewish lawmakers asking other lawmakers to support laws which violate the constitution but protect foreign business interests seems like the kind of thing that an elected politician should be able to criticise. If she had been paying attention to British politics of the past few years, Omar would have been aware of the fact that bad-faith accusations of antisemitism are a staple tactic of the right against the left. Ever since the 2015 Labour election, the right has been trying to find an effective smear against Jeremy Corbyn. Having failed to destroy his support by calling him either unellectable or a marxist, they tried showing his links to the Irish Republican Army and pointing out that he didn’t want to use thermonuclear weaponry as Corbyn is a lifelong supporter of the campaign for nuclear disarmament. With these attacks going nowhere, as most people would rather not go to nuclear war and most Brits either don’t care much about the North of Ireland or regard at least some of the British policy pre-Good Friday to be a source of shame, another smear was needed. This came in the form of accusations of anti-semitism. Corbyn had, and still has, one of the best voting records on combating racism, including anti-semitism, of any MP. Many Early Day Motions (EDMs) in parliament are ignored as they are often seen as less important, at least to the official agendas of the parties. This is true of several which Corbyn not only supported but co sponsored, such as one calling on the British Government to resettle Jews from Yemen in 2010, which cited that the conflict had exacerbated the already existing persecution of Jews there. It’s worth noting that Britain’s support for Saudi imperialism leaves much responsibility for the horror of Yemen at Westminster’s door. This motion failed, at least in part because many Labour members, including Blairites like Margaret Hodge, didn’t show up to vote. A similar story is true of a 2012 EDM calling on BBC Manchester not to cancel “Jewish Citizen Manchester” because it’s important for the Jewish community to have a voice. Accusations of anti-semitism aimed at Corbyn are as unfounded as those aimed at Omar. He too, made the faux pas of opposing Israel’s occupation of Palestinian lands and supporting the rights of the Palestinian people. As with Corbyn’s support for Irish republicanism, he was attacked for having connections “terrorist” groups and “terrorist” sympathising political parties. That Hamas are anti-semitic and hold deeply troubling politics is obvious, but that Hamas should be excluded from movements fighting for the rights of Palestinians is patently ridiculous. None of this is to suggest that there are no anti-semites on the left. Figures like Ken Livingstone and George Galloway say demonstrably untrue and toxic things about the holocaust and Jews. Both of these men, however, have been suspended from the Labour party. The main focus of most of these conversations is that the Corbyn opposes adopting part of the International Holocaust Remembrance Alliance’s (IHRA) working definitions of anti-semitism, namely those pertaining to Israel. According to the IHRA, “denying the Jewish people their right to self-determination, e.g. by claiming that the existence of a State of Israel is a racist endeavor” is anti-semitic, as is “drawing comparisons of contemporary Israeli policy to that of the Nazis.” Nevermind that this would mark the late holocaust survivor and pro-palestine activist Hajo Meyer as an anti-semite. Nevermind that the Conservative party have yet to ratify any definition of islamophobia. Nevermind, particularly, that every legal expert yet to comment on the definitions says that, if taken as binding, would have what Jeffrey Robertson, QC describes as “a chilling effect of free speech and legitimate criticism of Israel.”It is obvious how one can avoid being called anti-semitic during discussions about Israel. What one must do is offer undying support for Israel and its policies. If one is to mention Israel’s abhorrent and illegal treatment of the Palestinian people, it is only to pretend to be a critic of Israeli policy, thus giving the following support for Israel even more weight. People defending the rights of the Palestinian people must not fall for this. As with Yemen, and Jewish Citizen Manchester, and the suspension of Ken Livingstone, and fighting the rise of neo-nazis across the world, the left must continue to oppose anti-semitism in all its forms. This can become difficult while the supporters of Israel continue to, as is ironically also a violation of IHRA’s working definitions, equate “Jews” and “Israel”. Previous articleMcIlroy & The Masters: Eleventh time lucky?